COPYRIGHT 2010, Solar-Vision Publishing, 44 GOLDEN COLORED PAGES and big font that's easy to read! 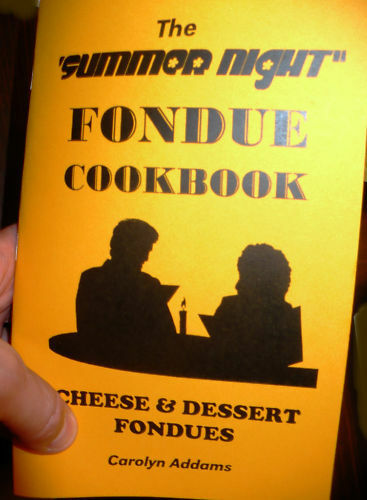 THIS Book focuses on the favorites of fondue! CHEESE AND DESSERTS, which keeps everyong coming back for more. This coming holiday would be the time to try fondue for a Special Christmas family get together whether you know the in's and outs of FONDUE or you are a beginner and always wanted to try fondue but figured it was to expensive or to hard to prepare. WHAT IF FONDUE IS TOO THIN OR TOO THICK?